Today we visited Cabana de Constancia, a diversified farming operation in the Sante Fe Provimce. Such beautiful grounds. Señor Gallo and his family operate their family farm, there we saw sheep, goats, llamas, ducks, and chickens. In addition we saw a plethora of plants on the grounds including a fig tree, orange and tangerine trees, olive bushes along with native Quebracho wood for fence posts and Ordupin for construction of gates about the grounds. 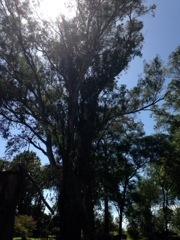 And finally many stately and beautiful Eucalyptus Trees that were planted in 1915. All this diversity of both Flora and Fauna but no Koalas. Thus is day three of our adventure. Stay tuned.